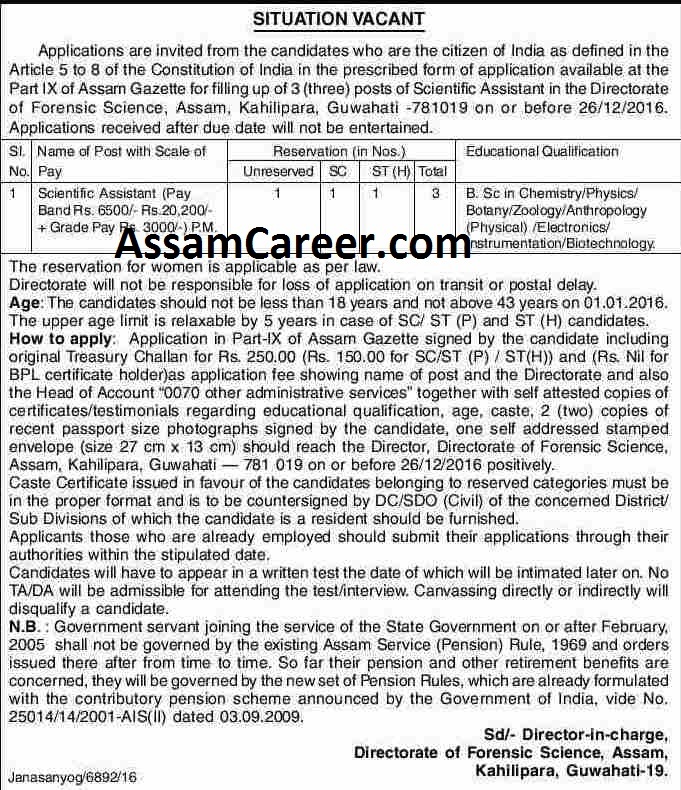 Applications in Standard Form as mentioned in Assam Gazette Part IX are invited from citizens of India for filling up the following posts under the Directorate of Forensic Science, Assam. Educational Qualification: BSc in Chemistry/ Physics/ Botany/ Zoology/ Anthropology [Physical]/ Electronics/ Instrumentation/ Biotechnology. How to apply: Candidates may apply in prescribed form of application including original Treasury Challan for Rs.250/- only (Rs.150/- for SC/ST (P)/ST(H) and Rs.NIL for BPL certificate holder as application fee showing the name of post and the Directorate and also the Head of Account "0070 other administrative services" together with self attested copies of certificates, testimonials regarding educational qualification, age, caste, 2 copies of recent passport size photographs signed by the candidate, one self-addressed stamped envelope of size 27x13cm so as to reach The Director, Directorate of Forensic Science, Assam, Kahilipara, Guwahati - 781 019, Assam on or before 26.12.2016 positively.